Expert local guiding and instruction is available for all mountaineering pursuits: Skye scrambles, Skye Munros, Cuillin Ridge Traverse, Rock Climbing, Scrambling, Abseiling, Ice climbing, Alpine training courses. All safety equipment is provided. Skye Guides Ltd provide high quality guiding and instruction available for all mountaineering pursuits, each day is designed to fit to the individual customer's ambitions and abilities. All our guides are highly experienced mountain instructors with a love of Skye & adventure. Beginners are welcome, you are never too young or too old for an adventure, take home a magical experience from your stay! BLOG Follow this link to see what we've been up to! Make the most of your trip with Skye Guides Ltd, www.skyeguides.co.uk. Summer is the busiest time of year for Skye Guides with most clients keen to explore the fantastic Black Cuillin. This dramatic mountain range has over 30 different peaks of which 12 are Munros, including the infamous Inaccessible Pinnacle (the In Pinn). We offer a broad range of guiding and instruction based here on Skye. Our itineraries are all bespoke so please feel free to Contact us by telephone or e-mail if you have specific objectives or would like to ask an opinion. Email mike@skyeguides.co.uk or phone 01471 822116. We offer introductory days to hiking, scrambling and rock climbing both in the mountains and around the coastline of the Isle of Skye. Achieve more than you could ever imagine with one of our expert guides to lead you. For the less adventurous, our guides also know plenty of easier routes that allow you to get great photos and views without any need for ropes. This option may also suit larger groups with mixed abilities. We also can provide two or three guides if within your group there are different ambitions or for larger parties wishing to climb the peaks. Climb Sgurr Alasdair – the highest point on the Isle of Skye. 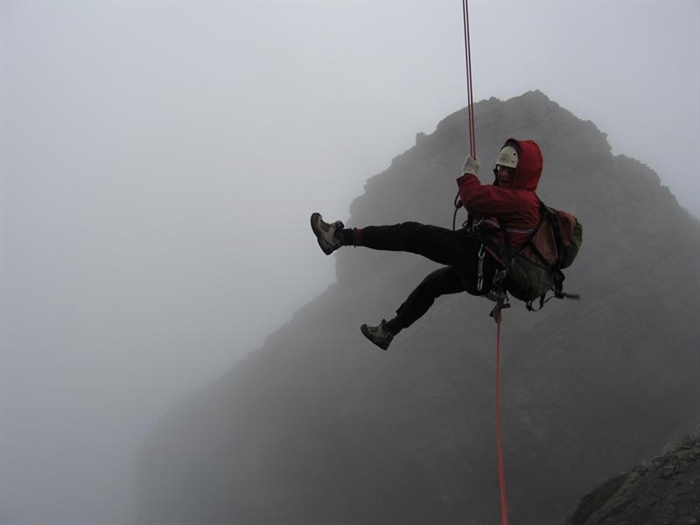 Conquer the Inaccessible Pinnacle – requiring ropes and a strong nerve. Ascend Sgurr nan Gillean – regarded by many as the most beautiful of all Cuillin peaks. How about Climbing The Cioch where Scottish actor Sean Connery had a sword fight in the film Highlander? 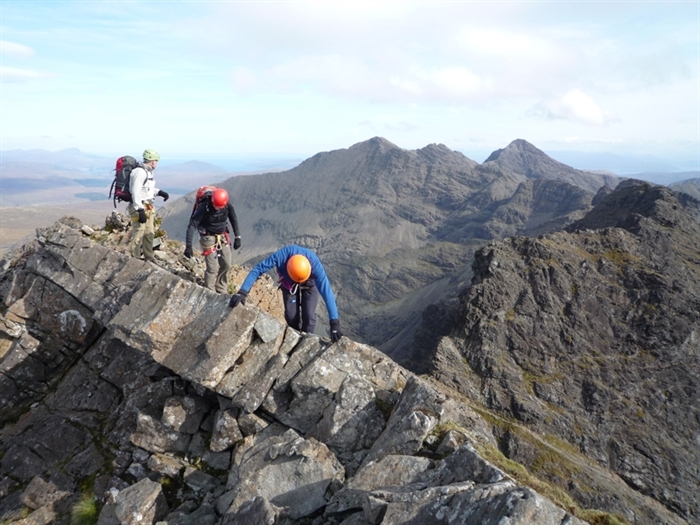 Introduction to Scrambling on the Cuillin Ridge – a great way to see the views and learn how to stay safe. Try Outdoor Rock Climbing – we specialise in teaching rock climbing at all levels. 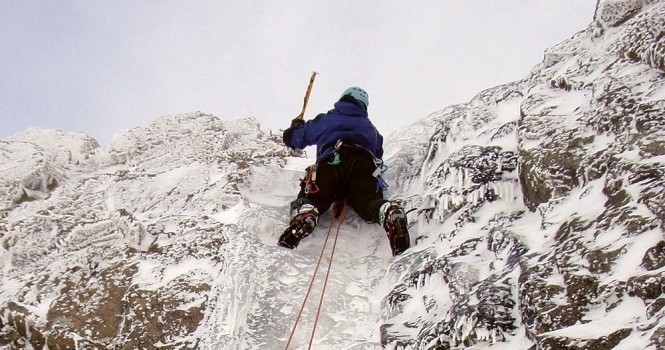 Rise to a challenge on a Classic Scramble such as Pinnacle Ridge, Clach Glas, or the Dubhs. Glamaig horse shoe: ascending to 2700ft starting at Sligachan Hotel and finishing on top of Glamaig before decending once more to Sligachan. The Cuillin Munros are the hardest to attain and linking them is even harder with many narrow ridges to scramble and concentration required on every step. Let Skye Guides help you enjoy the challenge and make the most of your trip. Guiding is available for single days, dedicated courses or however many days you need. We are approached by Munro baggers of all fitness levels, abilities and experience and adjust our itineraries to suit each party. 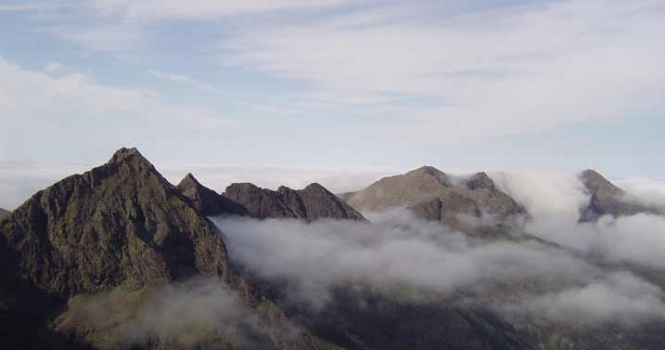 Click Cuillin Munros to see which option is best suited to your needs. Scrambling is an exhilarating pastime for anyone with a sense of adventure. It is climbing of the simplest, purest and most exhilarating form, often following the crest of an airy ridge. Our guides are experts in knowing how and when to safeguard clients in these situations. The Black Cuillin is the home of scrambling in the UK, with a lifetime of different routes to explore. Scrambling routes involve the simplest form of rock climbing and mark the cross-over from hill-walking to climbing. Sgurr nan Gillean to Bruach na Frithe : ascending Sgurr nan Gillean by Basteir gorge, onto Am Bhasteir finishing on Bruach na Frithe before descending to Sligachan (8hrs). Good level of fitness required. Rock climbing - Skye has such a huge wealth of Rock climbing that two separate guidebooks are now needed to cover the island. The Cuillin edition is written by Skye Guides owner Mike Lates. All of our Guides are keen, active climbers as well as professional instructors. Our local knowledge helps us to find dry rock and suitable routes whatever your experience or ambitions. 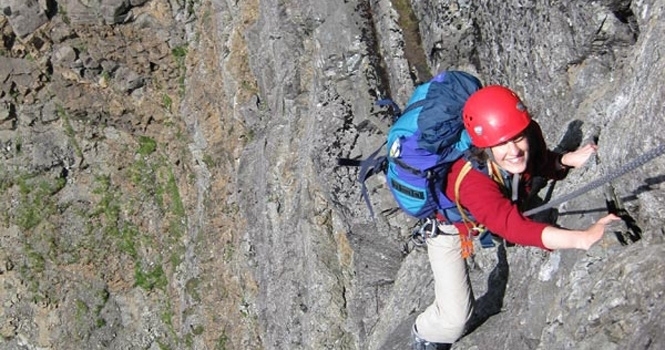 Skye Guides specialises in teaching rock climbing at all levels. Fun days out or courses dedicated to developing skills all have one common objective- to spend as much time climbing as possible. Intro to Rock climbing at Elgol or Neist Point: Learn basic rope & belaying techniques. Practice on the easier routes with the aim of becoming a competant second and climbing as many routes as possible during the day! Main Ridge Traverse - The jewel in the Cuillin crown. Twenty-two peaks lie in a continuous chain stretching over 12 kilometres and, with over 4000 metres of ascent and descent, gives one of the finest and longest Alpine-style rock routes in Europe. 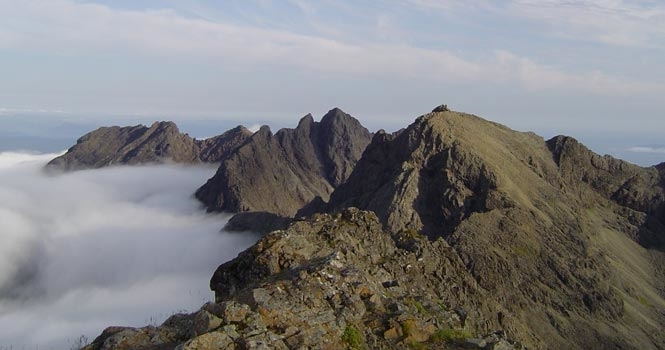 The Cuillin Ridge Traverse is Britain’s finest mountaineering challenge but is a major undertaking only suitable for those with a high level of fitness, strength and agility. Skye Guides offers a service to guide clients of suitable ability when weather conditions are favourable. Spend two days out with a bivvy on the ridge to complete the most challenging mountaineering route in Scotland, traversing the main Cuillin ridge from end to end - only the very fit need apply! Ascend via the Sgumain stone chute before donning crampons up the snowy crest to Alasdair, descending via the great stone chute. Views hopefully taking in Ben Nevis to the south and the whole of the ridge illuminated with crisp snow.